I’ll admit, I have a great weakness for post-apocalyptic stories. And although I do not wish to see the premises from the Conrad Williams’ novel synopsis becoming reality I certainly liked to see them unfold from the pages of “One”. 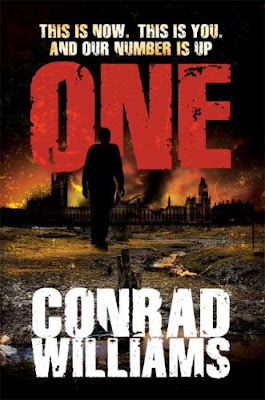 Conrad Williams makes no secret that the main theme of “One” is a post-apocalyptic one and this seen even from the early pages of the novel. The Earth is shook by a catastrophic event, an event that catches the main character, Richard Jane, in the middle of his work diving in the waters of the North Sea. Williams’ makes a different approach in his novel than other post-apocalyptic scenarios I read, but I enjoyed it in the fullest nonetheless. He doesn’t state a reason for the novel’s cataclysm but in the end he doesn’t have to. This fact makes his scenario more plausible, especially since almost half of the novel, and as the title suggests, is spent by Richard Jane in solitude. So without a proper knowledge it will be hard for him to find a reason for the situation. Although Williams keeps this mystery until he makes the final dot on his novel I find this aspect to give his novel even more power and bringing it even more closer to a disturbing undesirable reality. However, Conrad Williams compensates the catastrophe’s enigma in his descriptions and the atmosphere built all along his novel. The novel is full of disturbing images born from the pen of the author, each and every single one of them creating an eerie atmosphere. What is impressive at the work of Conrad Williams is that although he uses elements meant to horrify, they are not forced into the pages of “One” for the sake of keeping a line of the horror genre, but in a logical and natural way for the context of the story. Also impressive is that Conrad Williams gave me the impression of stillness and silence throughout the most of the first part of his novel. In that part Richard Jane moves through the country alone and since nothing moves around him the sense of desolation is brought forth through the talent of the author. The second part of the novel comes with few surprises. Conrad Williams brings into the story a few elements, of horror and science fiction, which will make the novel even more pleasant, if that was possible. With an already eerie atmosphere these elements unsettled me further on, adding new layers of terror into an already undesirable scenario. Because of these elements the reader will breathe a bit faster, along with the characters involved in the story. The second part will move also faster, the story picking up speed and heading for an ending that will come with a shimmer of hope though. Richard Jane is the main character of the novel, caught underwater by the catastrophic event he manages to land on the coast of Scotland on a life boat. From here he begins a journey to London in search of his son. Richard Jane is a powerfully built character, one I enjoyed in the fullest. With each page and event in the novel, he gathers depth, going through a wide range of emotions that will make him almost palpable. His memories of the past will add contour to his shape giving more reason and realism to his actions. Being the central figure of the novel Richard Jane catches most of the spotlight, but there are other characters on the scene as well. Not as deep as Jane, but with a strong building too are Becky and Aidan, two characters who will make a great contribution to the story and to the construction of the main character, Richard Jane. “One” is more than just a post-apocalyptic scenario or a horror novel. It is unfair to imprison it in the boundaries of these genres, because many readers will miss it because of this. Conrad Williams created a memorable novel, a powerful story that steps out and which will haunt the reader long after the reading is finished. I'm glad you liked this book. I thought it was pretty good too! I hope that this "One" isn't a clone of a McCarthy's. "The Road" is a very intelligent recycling of old motifs (already 'chewed' in dozens of SF novels) but having regular peoples' feelings as the main theme. And, of course, almost perfectly written. I loved "the Unblemished" which I considered a real work of art but was slightly disappointed in "One". It got off to a very slow start and the ending , although visceral and exciting, came almost out of nowhere. The novel also felt like it had too much of a commercial bent i.e. trying to be too many things for too many audiences. I do love Mr.Williams' short stories and did enjoy his most recent, "The Cold" - I saw many shades of Derek Raymond in its style but am getting very frustrated by the repeated delays in his North American publication dates of "Decay Inevitable". Originally scheduled to come out in early September, Amazon is now telling me that it may be after late November. I bought "Decay Inevitable" from The Book Depository and I think this site has a free shipping to North America as well. I was disappointed by what I thought would be a welcome reinvention of the horror dystopian novel with One. Did anyone else feel the Skinners were a weird reiteration of the metaphor of Alien? I seriously never wanted to check out a book more in my entire life. Will definitely try to get my hands on this one.